Did you know that frogs breathe through their skin as well as their lungs? And did you know that milk is used to neutralize the tannins in white wine? 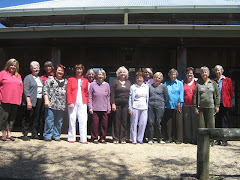 The ladies of the Lake George View Club do, after visiting the Mt Majura Vineyard at their September meeting. 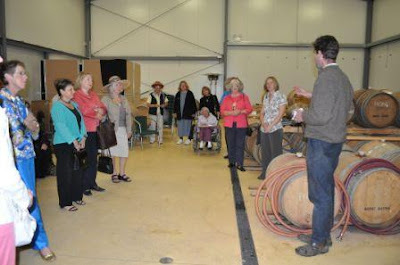 Wine-maker Frank van de Loo gave us a wonderful insight into wine-making, its technical intricacies and all the steps that are taken to produce the wine before a mobile bottling plant comes in and bottles the finished product ready for sale. What a lovely, satisfying job – Frank who is ex -CSIRO, is very happy with his wine-making career and it shows! Emma Keightley was also in her element talking about frogs which are her passion. We learnt about her organization Frogwatch and all the good work it does educating school children and adults about frogs and their habitat. An education officer visits the schools with tadpole kits so the children can watch the tadpoles’ progress (remember the wonder of this? – even as young children we were aware of the fragility of the leg-growing process and had a great respect for that little tadpole while it was turning into a frog). The organization has over 200 volunteers and there are 29 sites in the ACT – all being monitored. The data thus collected is used for policy making and to see what impact projects would have on certain areas and the effects of drought on the frog population – all good stuff. Afterwards we had a Q&A, and came away with websites and a glove-box guide of frogs in the ACT region. I went home to check out my dam just across the border in Palerang – thinking maybe I will find a Spotted Marsh frog or a Whistling Tree frog. 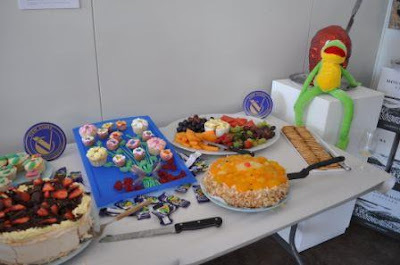 To complete the ‘frog’ theme – our luncheon was beautifully prepared (by talented Club member June, well done June!) and presented on hand-painted, ceramic platters depicting frogs in their habitat. We dined al fresco, while enjoying some of Frank’s wine. Spring has sprung with the wonders of nature and a gourmet spread fit for a queen. What an imaginative treat June provided for club members! Very interesting and amazing at the work that goes into the making of wine. 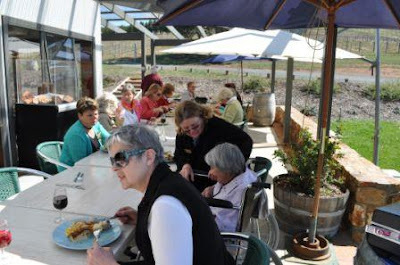 In particular to hear about Majura Winery and the history behind it.